Upcoming Weather: It is too soon to tell what short-term weather conditions will be following Hurricane Florence, however we know from previous experience (such as the very wet fall we had in 2015) that continued wet conditions following this event will likely lead to intensified diseases and degradation of seed quality. 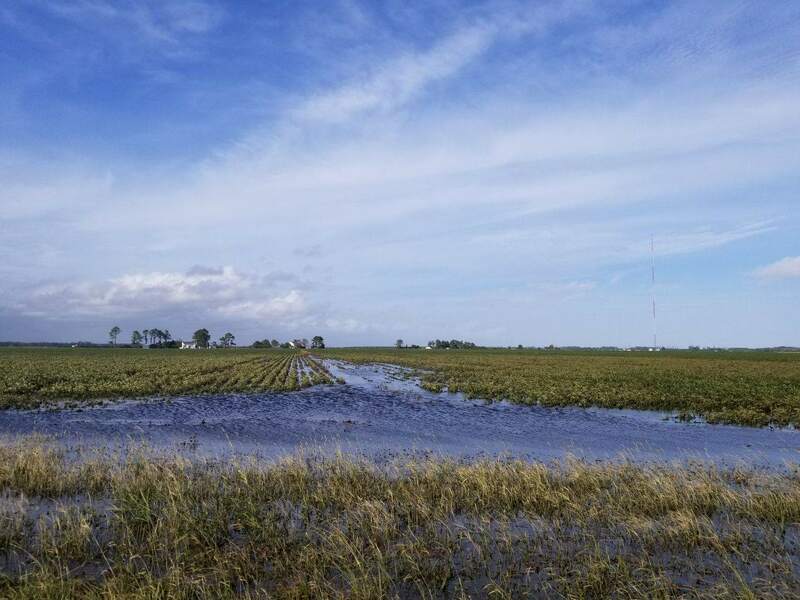 Quality: Soybeans that have been under flooded conditions for several days have an increased risk of being contaminated by things such as mycotoxins and diseases. Excessive rainfall can cause pod splitting. This is especially problematic if the excessive rainfall followed a dry spell, as was experienced in parts of North Carolina prior to Hurricane Florence. When soybeans are at R6 (full seed) or R7 (physiological maturity) and receive excessive rainfall, rapid seed growth can cause pod splitting, especially when pods are small due to earlier season stressors. Premature seed sprouting is generally rare but can be an issue when the moisture of the seed drops below 50%, and then goes back above 50%. We already have reports of seed sprouting and pod splitting in North Carolina following Hurricane Florence. See the disease section below for diseases that can impact seed quality. Lodging: Soybean lodging can be caused by strong winds and by water flow across the field. The effect of lodging on soybean yield is variable, but soybeans in the beginning seed stage (R5) will likely be more prone to damage from lodging than soybeans that are further into physiological development. There are two types of yield losses associated with lodging including restriction of maximum physiological development and harvest loss. Restriction of maximum physiological development can occur from lodging reducing photosynthesis in the upper, more productive leaves. Harvest loss from lodging can range from 3-10% (Holshouser, 2015). Slowing down the combine may reduce harvest losses from lodged soybeans. Lodging is more likely with higher yielding soybeans. Shattering: Shattering is intensified when dry pods are rehydrated by excessive moisture followed again by a dry period. Shattering losses can be more severe with earlier maturing varieties that are close to physiological maturity and are ready for harvest. Unfortunately, the current conditions in North Carolina will restrict field access in some areas of the state, and this delayed harvest can intensify shattering. If you have a field where harvest shatter is a problem, harvesting that field as early as possible, starting earlier is the day when the plant material still has some moisture, and slowing down combine speed may all reduce losses from shatter. Diseases: Leaf diseases and potential root rots (Phytophthora and Pythium) will likely be more severe after this amount of rain and flooding. Foliar diseases like brown spot, frogeye leaf spot, and Cercospora blight may also be more severe. If soybeans are still between R3 (beginning pod) and R5 (beginning seed), a fungicide application may be warranted and could help prevent seed quality issues. Using a mixed mode of action or a FRAC group 3 (DMI/triazoles) fungicide should help provide some control for these pathogens. Flooding damage to roots makes them more susceptible to rotting pathogens. If they are present, they will likely be most severe in the low lying portions of the field or portions of the field with significant flooding. Root rots are not economically manageable at this stage with chemical applications. Destroying crop debris where possible will reduce overwintering inoculum for future soybean stands. Several diseases impacting seed quality are intensified by warm, wet conditions. Phomopsis seed decay can negatively impact soybean seed causing shriveled, elongated, cracked, and or chalky appearance. It has also been noted as a quality challenge for early maturing soybeans in the Southeast. Purple seed stain/Cercospora blight can also reduce soybean quality, causing germination issues for seed beans. Fungicide applications prior to R5 (beginning seed) may help prevent Phomopsis and purple seed stain. Weeds: Flow of water from rivers, streams, etc. may carry weed seed into your field and cause weed problems you have not traditionally had. With the increasing amount of herbicide-resistant weed seed across the state, you should be aggressive in managing weeds in these flooded fields next year. Britton, T. 2016. Hurricane Matthew and Soybeans. Cooperative Extension. North Carolina State University Cooperative Extension. Holshouser, D. 2011. The Good and Bad of a Wet September. Virginia Tech University Cooperative Extension. Holshouser, D. 2015. Lodging and It’s Effect on Soybean Yield. Virginia Tech University Cooperative Extension. Stowe, K. 2016. 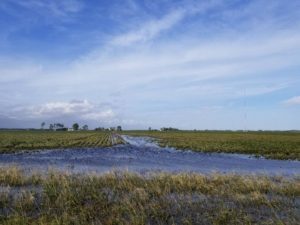 Managing Flood Damaged Soybeans. North Carolina Soybean Producers Association.